Retail design stems from one basic goal to make sales and money. 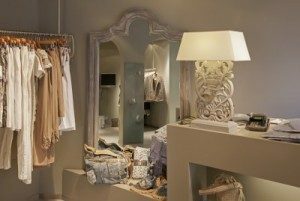 Entrepreneurs have a vision for their retail store or boutique. A lot of heart and soul goes into making a store everything that the creator hopes it will be. Keeping the goal of sales in mind, you can create an interesting and inviting layout that will not only make your merchandise look great, but will also guide customers into the store, through the store, and help them decide to make purchases. Use this retail design guide as a resource for making sure that you’ve thought of every angle when deciding on your retail design and retail display ideas. Everything you decide on should be because you went through these questions and answered “YES” to all of them. If you do that, you’re bound to be successful. 1. Does the display seem inviting? From the front of your store to the back, everything should feel inviting. People should want to investigate, touch, feel, smell, and try out merchandise from the second they enter the store. A buyer has many questions in mind when they’re deciding whether or not to purchase something. Your displays should effectively and decisively answer these unspoken questions every minute that a person is shopping. Instill confidence and trust in each customer. Peak their interest. Make them want to tell their friends about how unique their shopping experience was. 2. Does the display instill confidence? When a shopper enters a store, they are immediately looking for a sense of control. They need to trust that your quality is as advertised. They need to trust that the style you portrayed on the outside of the store and in your store front windows is the same style that they will find when they step inside. They need to trust that the price range you implied with your store front is the same that they will find when they start looking. They need to trust that advertised attitude and the feel of the store is what they will experience inside. The second you betray that trust, you will lose them. It is very important to make sure that your retail fixtures and displays effectively communicate these things. 3. Does the display feature a balanced mix of interesting and basic merchandise? When you create a display, you want to sell your best and highest priced merchandise, of course. However, you don’t want someone to see a lot of designer handbags, scarves, and unique items in one area and then a table of plain t-shirts and a clearance rack right after. It interrupts their line of thinking as their making judgments about your store. A healthy balance of interesting and plain merchandise helps people see how they can coordinate different items and it keeps them on the right track. You want them to think that your entire store is interesting, not just the entrance. About the Author: John Garvey is on the staff of Only Garment Racks, a leading online source of garment racks and clothing racks. Click here to visit OnlyGarmentRacks.com today.